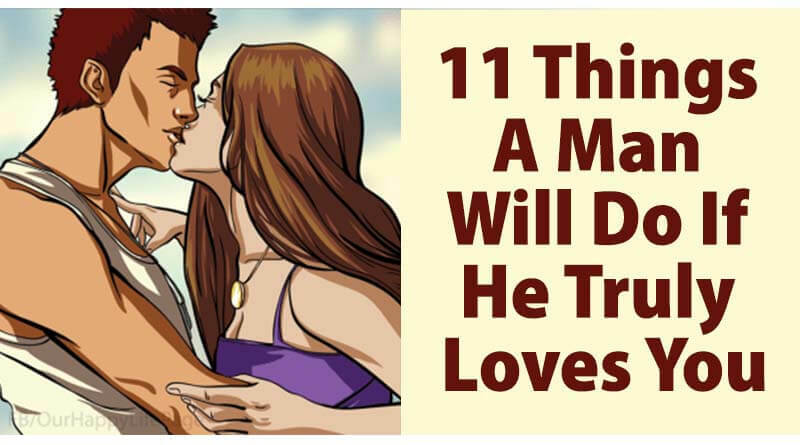 11 Things A Man Will Do If He Truly Loves You - ShareIt! We men are not great at expressing our emotions in words. We are more comfortable with deeds and actions than trying to express complex emotional states we are already uncomfortable examining. We are raised to be strong and unshakable bastions of safety that our friends, family and lovers can retreat to when they are in pain or danger. Being vulnerable and open is difficult for us, but not impossible. It is fairly obvious when we have opened the castle gates of our hearts and let someone in. 1. He feels immense joy whenever he sees you. Whether he’s tired or irritated from work or he just isn’t in the mood seeing you puts a smile on his face and fills his heart with warmth. You shine a light on his world and you should cherish it. Maybe we can be a bit boring with our girl problems and our endless chit-chats but if he truly loves you he’ll just listen without saying a word. He’ll never say you talk too much because he loves to listen to you and knows it’s important for you. Your opinion really matters to him and he’ll listen to everything you have to say, be it something meaningless like his new haircut or something more important. 4. He never complains that you take up most space in bed. You might be a small person but you probably take up most of the space on your bed. Still he doesn’t mind and lets you do it night after night. That’s true love. He probably isn’t a fan of Spa day and would rather watch a game on Sunday but he still goes with you because he knows it’s what you like. 9. He keeps the romance going. Romance isn’t just about taking you to bed, he wants to spend quality time with you and get to know you and everything you are. Sometimes it does end in the bedroom but even if it doesn’t it’s all the same for him. 10. He feels proud to have you in his life. The smallest things you achieve make him feel proud and he’ll never stop bragging about everything his girlfriend had made in life.